Carlos - That multi-hue blue is a striking combination, one I have not seen before. Mr. K - Is that masking material Panzer Putty? I used that material for the first time on an armor project last year, great stuff! Peter - That is really a great looking aircraft, I would like to build one of them myself! For some reason I thought I had another month on this campaign, my bad! I'm still working on the cockpit and see no way I can complete without rushing the build and that would take the joy out of it. I will keep working on it and finish on the campaign for those of us who have blown our deadlines. do you need an extension fellow Campaigners ? I certainly do I've had a canopy failure and I can't get a replacement so I've got to switch kits. Mr K, I really like your model. I didn't know there was a Su-33 twin-seat but it is clearly in my wishlist now. I had a few last minute problems. The main one is that the masking tape got stuck, like melted. Weird as it was only the sections with Tamiya masking tape for curves. I have used that masking tape before with no problems... Who knows. I had to repaint a few sections of the exhausts. I did a quick repair paint job on top and it shows. I will do it better next time. 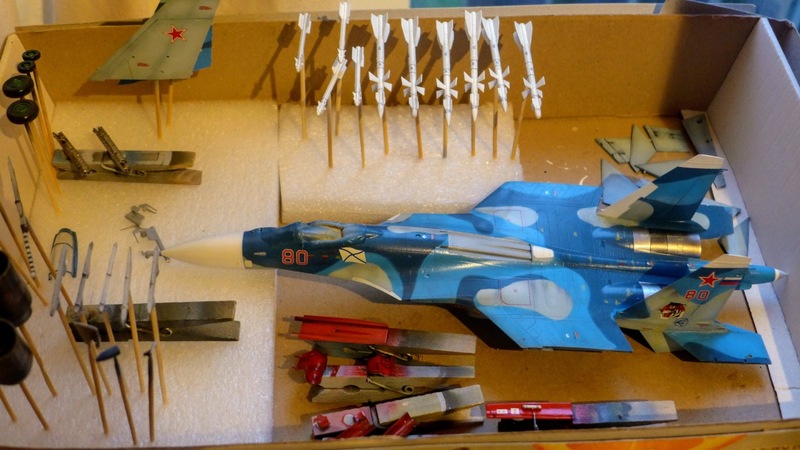 Anyway, this is how my su-33 looks now. I thought about this but would need a month rather than week or two that is traditional. This is a case of brain fade on my part, I just got my deadline mixed up. I'll ask for an extension then. You have until 1 April, so hop to it! Thanks guys, I'll put Fishpot back on the front burner. One of the reasons I'm taking some time with this is that I'm going to try using my airbrush rather than rattle cans. I have a new simple Badger that I would like to use to get over my airbrushophobia . . .
Paul I hear you on that one! I eschewed airbrushes for ages out of a kind of fear and lack of knowledge I guess? But started out using cheap Chinese knock off's and graduated to a Harder & Steenbeck infinity. I still use brushes but usually for detail painting. I'm now looking for my next airbrush but my wallet has hidden itself and is running scared LOL. Persevere with it it will reward you for the effort, it is how most aircraft were painted. Congrats for the same method. That's a kind of blue-tack for office stuff that bought many years ago. Sorry, I don't remember its brand, but not Panzer Putty nowadays. I think Su-33UB is the precursor of Su-34 because of the same cockpit structure. Trumpeter had mistaken some details in the instructions sheet. My model is far from perfect but I am done. I was really happy with the build and the paint job but I have made a mess with the panel line wash. It is the first time I use Tamiya panel accent and I didn't get on well with it. There is always something. Camo is done. The darkest blue/green from the Hakata paint set is really dark and original attempt looked really incorrect compared to reference photos of the aircraft. I lightened it by half with the lighter color but it still looks to dark to me. Decals next! The modern Sukhois are very handsome aircraft and the camo is effective in breaking up the shape. I can see how it would blend in with the water when viewed from above in some places. I shot some rattle can black on the SU-9 project. Fittings for the airbrush just arrive so with any luck the brush, hose & compressor will all work in harmony. Next will be the pale grey/blue in the cockpit & on the seat. Michael, thanks for the extension on this campaign. Done just in time right before I pack all the hobby supplies up to move. Learned a lot about using the Hakata paints, not sure I will use them again. Nice work on that build Brian !! I got the airbrush working over the weekend. The brush is a simple Badger which was recommended to me as a good place to start. My last experience was with one of the all-signing, all-dancing models that confused me and was possibly defective. That was ten or fifteen years ago. Sunday with the new brush, hose & fittings attached to the old compressor I was able to shoot the cockpit color for the Sukhoi SU-9. The color came out more green than I expected after it dried but it will be fine considering all the other problem with the cockpit. Brian - That is a stunning paint job, good work. John and Paul, thanks for the comments!